Ellicott Meadows is an intimate 55+ community in Ellicott City, Maryland. This active adult community consists of 160 low-maintenance townhomes and single-family homes available on a resale-only basis. Homebuyers are drawn to this Howard County community because they can downsize without having to give up style and elegance. Ellicott Meadows is filled with amenities for its residents. Residents are encouraged to live an active lifestyle and the community continues to plan fun neighborhood events and activities that range from hobbies to happy hours. 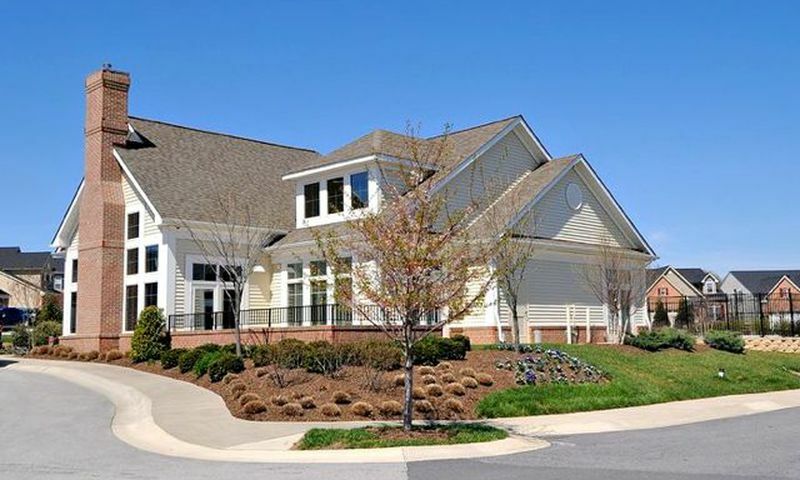 The plentiful amenities at Ellicott Meadows start at the community’s exclusive clubhouse. Here, residents have everything needed to stay active both physically and socially. The exercise room, equipped with state-of-the-art cardiovascular and strength-training machines, is a great place to stay in shape. The meeting room and library are perfect locations for hosting your next club event. Just outside of the clubhouse, residents can embrace their competitive side on the tennis court. The outdoor pool is also a great place to attend water aerobics classes or socialize with neighbors at a pool party. Ellicott Meadows consists of 160 low-maintenance residences that were built between 2003 and 2006. NV Homes built 92 townhomes and Ryan Homes built 68 single-family homes. These luxurious, carefree homes offer at least two bedrooms, two bathrooms, and attached garages. All of the residences throughout Ellicott Meadows were designed for active adults with first-floor master suites and low-maintenance exteriors. Ellicott Meadows welcomes homebuyers aged 55 and better. The community is continuously planning fun activities, events, and trips. Ellicott Meadows’ activities revolve around hobbies and interests such as card games, exercise classes, or reading. Getting to know your new neighbors and making lifelong friends is easy with regularly planned events like happy hours, grill nights, pool parties, and scheduled trips throughout Howard County. Ellicott Meadows’ residents truly enjoy an active lifestyle. Homeowners have more time socializing with neighbors because the homeowners association takes care of the hassles of home maintenance. They enjoy not having to worry about landscaping, snow removal, and exterior-home maintenance because a professional management company covers these tedious chores with an association fee. Ellicott Meadows is located just north of Route 144 (Frederick Road) in Ellicott City, Maryland. Historic Ellicott City is rich in history with walking tours, museums, and recreational areas. Ellicott City also has fine dining, antique shops, and a brewery for fun entertainment options. The world-famous, historic waterfront city of Baltimore is located only 30 minutes away from Ellicott Meadows. Baltimore is home to the popular Inner Harbor area and historic Fells Point. History buffs will enjoy visiting Annapolis or Washington D.C. which are about an hour away. Ellicott Meadows is a great 55+ community that has everything to offer homeowners in Howard County, Maryland. There are plenty of activities available in Ellicott Meadows. Here is a sample of some of the clubs, activities and classes offered here. NV Homes built 92 townhomes throughout Ellicott Meadows. These homes feature first-floor master suites with at least two bedrooms, two bathrooms, and attached garages. Please Note: Floor plans are not available at this time. Ryan Homes built 68 single-family homes throughout Ellicott Meadows. Residents enjoy private yards and main-level living. These homes have at least two bedrooms, two bathrooms, and an attached two-car garage. Please Note: Floor plans are not available at this time. 55places.com is not affiliated with the developer(s) or homeowners association of Ellicott Meadows. The information you submit is distributed to a 55places.com Partner Agent, who is a licensed real estate agent. The information regarding Ellicott Meadows has not been verified or approved by the developer or homeowners association. Please verify all information prior to purchasing. 55places.com is not responsible for any errors regarding the information displayed on this website.